Adelaide Food Central was lucky enough to be invited to try out some of Patty Mac’s delicious menu last Tuesday evening. The two-month-old store is already famous for its American Diner atmosphere and it’s authentic style burgers and hot dogs. 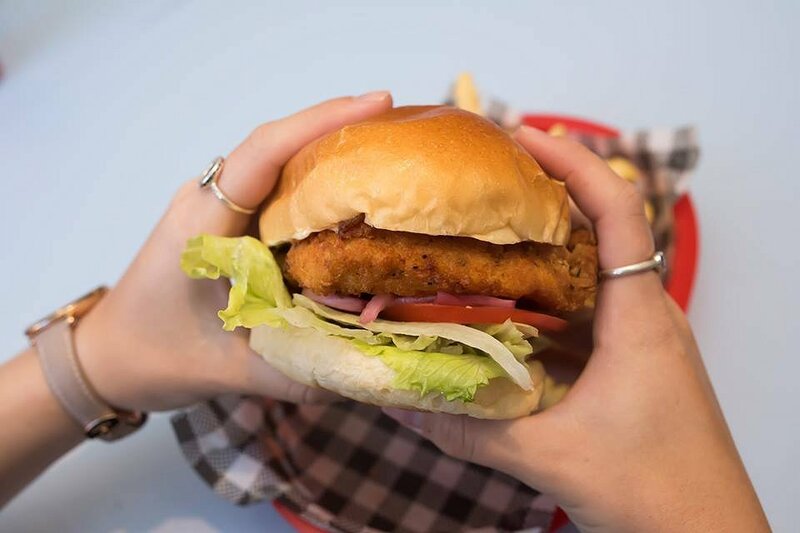 Located on the first floor of the Adelaide Casino, Patty Mac’s is in the prime location for customers to meet up with friends and eat delicious food any day for lunch or dinner. Patty Mac’s Chef, John Holmes, gave us a selection of dishes to have a taste of what they serve on their full menu. “We worked very hard to come up with this concept. […] Many hours of trying new flavour combinations went in to create something unique. “We are constantly working on trying to improve our product”, John Holmes said. There were four starters that we got to share upon arrival. The first, Balls of Fire; Crunchy Mac n’ Cheese balls, accompanied by a Sriracha-Ranch dressing. 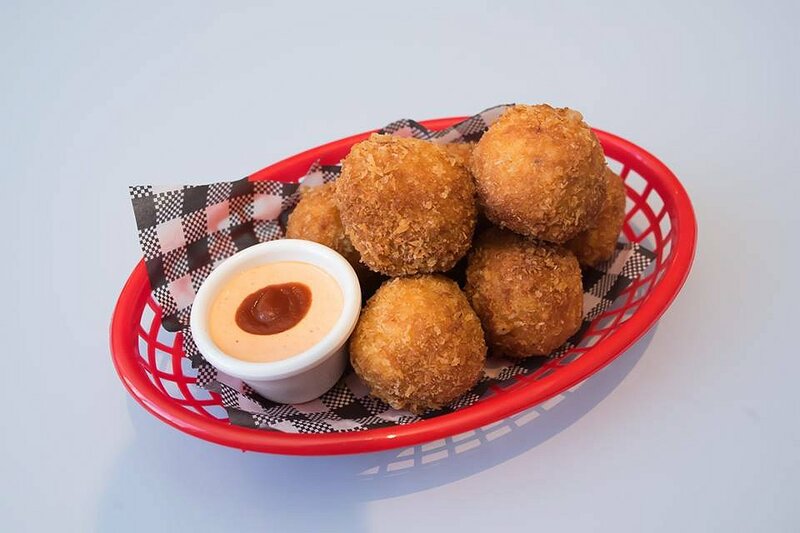 Mac n’ Cheese balls were the perfect way to start our night. The crunchy fried outer coating balanced perfectly with the smooth thick Mac n’ Cheese centre. The Macaroni was lovely and cooked well. This dish was definitely cheesy heaven and made me want to order more, or even learn the recipie so I could make them at home. The Sriracha dressing also added a lovely hit of spice to the savoury dish; complimenting well with the cheese centre. Next up was the Apple Slaw. 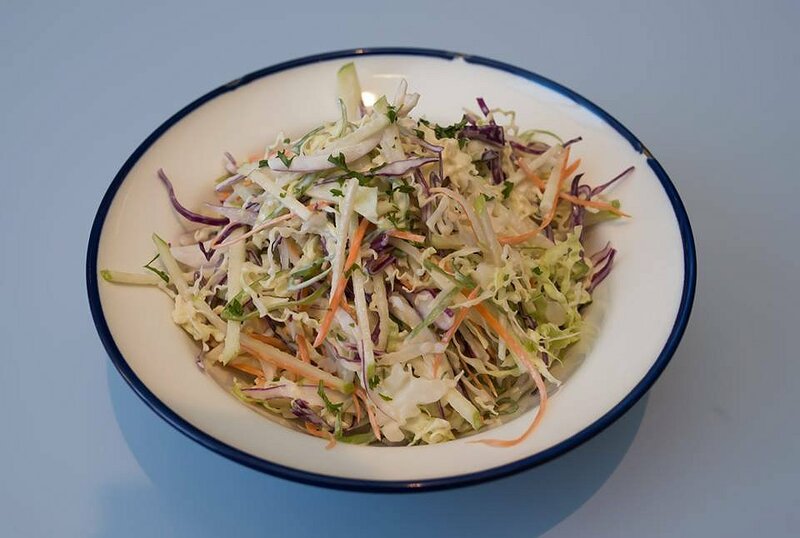 The refreshing and light slaw consisted of White and Red Cabbage, Carrot, Red Onion, Mustard, Sour Cream and Apple. Each component was thinly sliced and was lovely and crispy in texture. We could tell by the beautiful flavours that the ingredients were fresh, with the apple being the hero of the dish as it created a lovely lightness and balance to the overall dish. The Buffalo Wings were next on the list to try; The beautifully cooked chicken wings were tender and pulled apart, and were coated in Patty’s Bourbon and Bacon Sauce. The two sauces complimented one another beautifully, one containing hot sriracha and the other, having a slight barbeque flavour that brought a balance hot, spicy and smokey combinations to the meal. 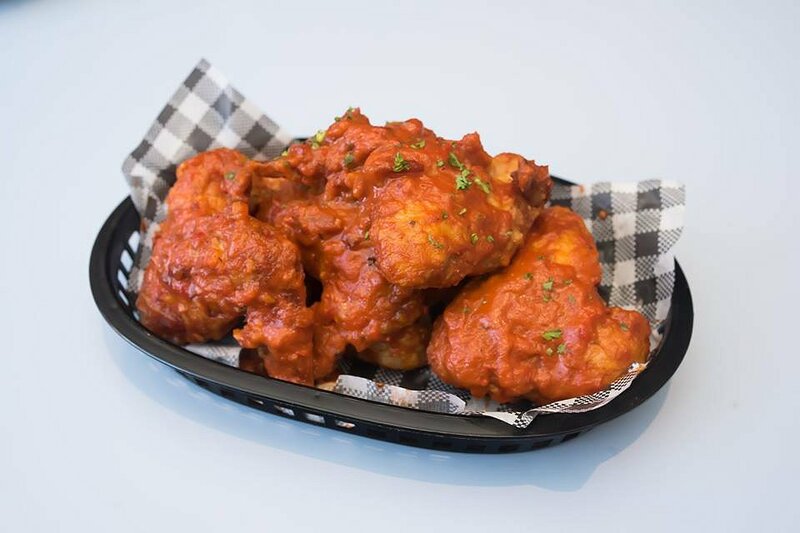 The Buffalo Wings are definitely for customers who love a bit of kick of spice to their meals and are definitely worth a try. Lastly for the entrée was the Cobb Salad. This beautiful mix of Dressed Greens, Chicken, Bacon, Avocado, Blue Cheese and Tomato’s was the perfect dish to prepare us for our main burgers to come. 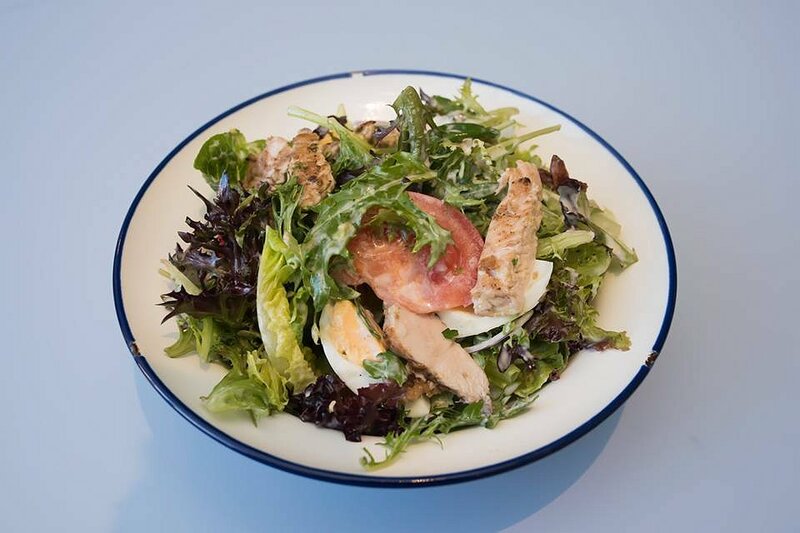 The soft and tender chicken was seasoned beautifully and the salad was lovely and fresh. The meal itself was refreshing and I would definitely order it again, even as a main dish. For the Mains, we were able to have a burger of our choice; and as there were two of us, we got to taste both the Southern Fried Chicken burger and the Patty Mac’s burger. The Southern Fried Chicken burger contained Fried Chicken, Lettuce, Tomato, Red Onion Pickle and Chips on the side. The burger had wonderful dressing, with a mix of two sauces, one an aioli and the other a smooth relish. The chicken was cooked beautifully and the coating had a nice crunch to it while the centre was tender and sweet. The coating was beautifully seasoned and also had a little spice to it but that balanced well with the fresh cool salad. All flavours of the savoury, the sweet and the sour, all balanced one another perfectly and overall was a very satisfying meal. The Patty Mac’s burger contained a Beef Patty, American Jack Cheese, Lettuce, Tomato, Pickles and a side of chips. The classic style burger had a nice and thick beef patty, which was well cooked and seasoned. The American cheese was nicely melted on top of the patty, creating a smooth texture with each bite of the burger. Both burgers were of a decent serving and were deliciously prepared, while the chips on both burgers were lovely, crunchy and well seasoned, and I couldn’t put them down. On top of the two burgers we tried, Patty Mac’s also offered up their BBQ Ranch burger; containing Beef, Cheddar Cheese, BBQ Sauce, American Slaw and Chips, and their Vegetarian Portobello burger; containing Crumber Confit Mushroom, Cheese, Onion, Pickled Tomato, Raita and Chips. For dessert we were served an authentic American Chocolate Cherry Pie. 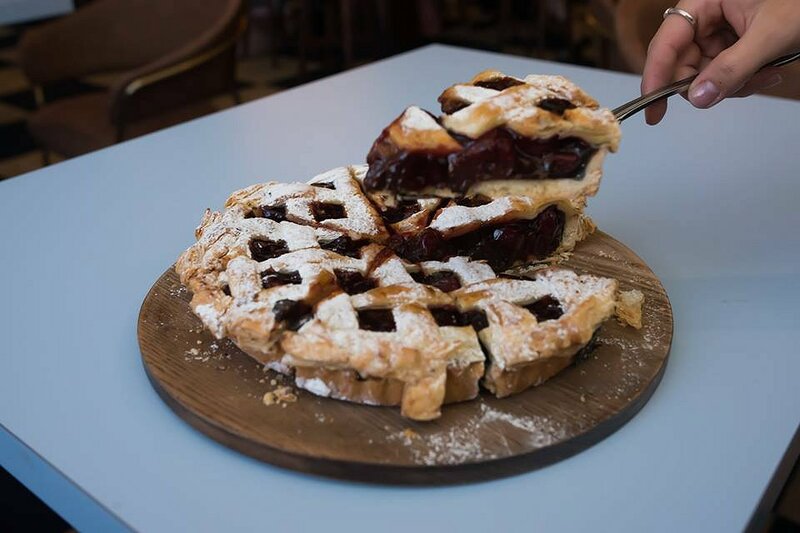 If you are a cherry lover, this pie is for you. The beautifully rich and fresh cherries were complimented well with the melted dark chocolate, balancing the flavours of sour and sweet. The Cherries were not too sweet and still held some tartness, which was perfect for the pie. Sweetness was also added with the fresh dusting of icing sugar on top of the beautifully cooked pastry. Even though we were all feeling full from the entrees and mains, we were able to fit in the delicious dessert; showing that Patty Mac’s famous quote: “There is always room for pie” lived up to it’s name. 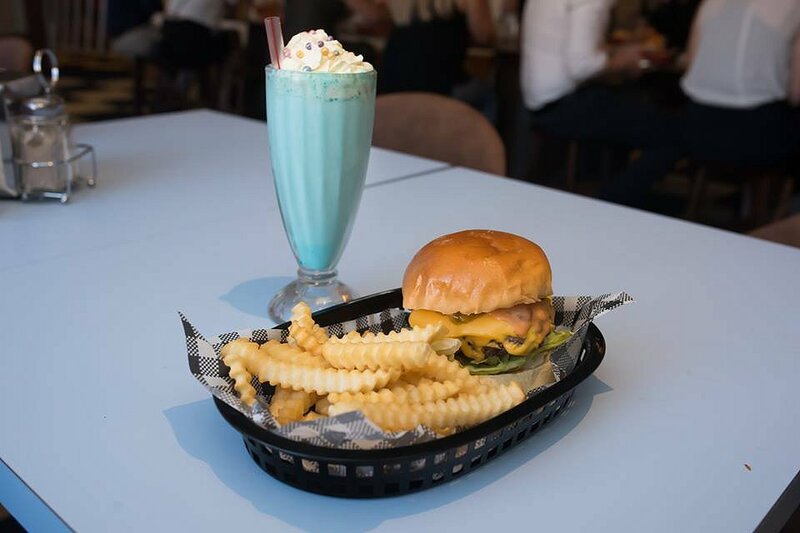 The American Diner restaurant have a huge range of other meals on their full menu, so if you aren’t in the mood for burgers, you can always try a classic Spaghetti Bolognese or even Fish and Chips. There is guaranteed to be something on the menu to satisfy your cravings. With “Such good food” literally written on the walls of the restaurant, you will just have to try it for yourself. Patty Mac’s are open from 11:00am to 8:30pm Sunday to Thursday and from 11:00am to 11:00pm Friday and Saturday. So why not come taste a slice of America for yourself and follow what Patty recommends: “Start with coffee, follow it with a classic of all classics cheeseburger and end with pie.” You wont be disappointed.